Happy Tuesday! Holy moley, a lot of you linked up and played along last week. THANK YOU!!! I hope you're all having a fabulous week! If you got Monday off - I'm jealous. :-) Besides being a holiday, Monday was race day. The Boston Marathon is about a half mile from my office...but I never got the chance to sneak out and watch. Maybe next year! Break pretzels into bite-size pieces and place in a large bowl. Combine remaining ingredients; pour over pretzels. Stir to coat. Pour into an ungreased baking pan and bake at 200° for 1 hour, stirring every 15 minutes. Love the pretzel bites idea - my son just looooves pretzels! Thanks for hosting, as always! I love the flavor of Ranch too ~ sounds like a recipe that you can't stop eating! 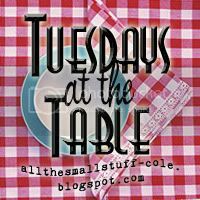 This is my first time visiting to your blog and participating in Tuesdays at the Table. I found your blog via Courtney at Women Living Well. Pretzels are a hit at our house so I'm definitely going to have to try these! Those pretzels sound totally delicious - and very addictive! Thank you for sharing them and for hosting. Thanks so much for hosting this each week! Love all the awesome recipes and ideas...definitely going to try the pretzel recipe...my girls love anything ranch and anything garlic! This sounds like a winner! Thanks so much for hosting! I love to go around and check everyones recipes out! I always love seeing what everyone has to offer! Thanks for hosting this!!! Wow! I love this idea. What a great snack for my kids. Thanks for hosting!! Yum! This sounds delish!! :D Thank you for hosting each week! I am having a major giveaway for anyone who is interested. Choice of four CSN gifts. Love your colorful blog and all the great recipes! Amazing as ever.. How are you doing?? Just checking in on you. I hope your Mom, and brother are great..
You definitely got my attention! Anything with pretzels and ranch you can't go wrong, thanks for sharing! Oh my! Who doesn't love pretzels? I'm gonna have to try these! Ok! I made these and thought they were good last night..Oh my even better this morning. LOVE THEM!! Thanks so much for such a delicious recipe. I featured it and given you full credit for it on my Tried it out Thursday post. It will post this afternoon. Hope it is all right. Thanks again! !